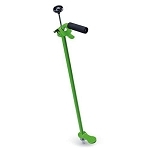 Zingrtools manufactures a weeding tool that eases the task of pulling weeds. The Weed Zinger uproots the weeds using well placed spikes then shoots the weed directly into the trash using a powerful spring and trigger mechanism. With a little swing of the arm and a well timed shot it is possible to shoot the weed up to 15 feet. The Weed Zinger ensures that the weeds won't clog the system or tool, removing the need for excessive pounding and pumping. The Wright Stuff is proud to offer this effective and effortless weed remover by Zingrtools. Pull weeds without bending, kneeling, or lifting!